Hello hello, I'm creating this thread as tracking log for my pixel art. All C&C's are welcome, but please take me easy as I'm (soon to be very obvious) only just beginning with PA Smiley , I will take any help I can get, and be extremely grateful for it. Currently I'm going through a number of tutorials, hoping to improve. I started with something very simple, black & white, just to get the correct setup in Photoshop and begin to dabble. which is a bit strange, because I've been drawing faces since I was a young girl. I feel very lost. I'm thinking it's probably the fact that I looked at pixel art as an entirely different art than classical art. 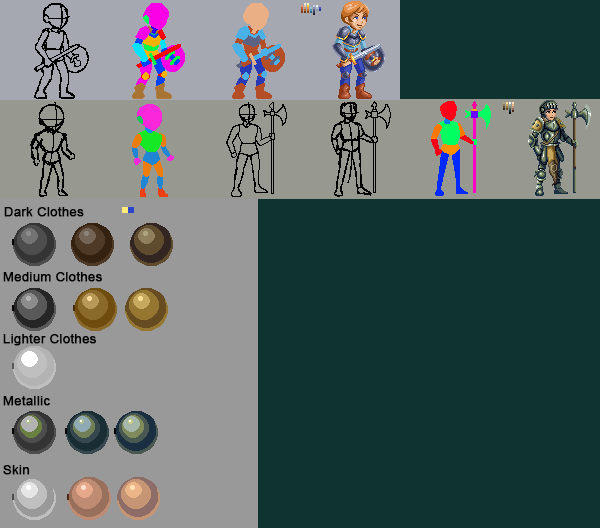 Day 3, I went into reading a number of tutorials, about Anti-Aliasing, about palette and shading, so I've tried each. I've tried to do anti-aliasing on a few simple lines, then created my own palette from monochromatic colors, then tried to do shading on three different shapes, and then tried to place a straight light on a cube. I also used the palette from the old GameBoy. I'm not sure what I did wrong, I think I could really use some guidance in improving. Hi Ash Crimson, thanks for the reply ! Are you referring to the AA, or to adding too many colors ? I didn't respect the action line in the start, so it came out all wrong. I'll keep on practicing. @AshCrimson thanks for the advice ! I'll take it easy on the AA :) . I'm still learning on the color palette, as I feel quite limited on colors, and I'm not entirely certain how to mix them, where to start and how to follow. I'm still having difficulties in choosing color palette, finalizing lines and doing proper shading, definitely would welcome any advice on that. I'd like to ask : how do I build or connect colors on the ramp ? Is hue-shifting restricted to neighbor colors or can I jump to other hues not connected to actual color ? I still don't know how to shift hues correctly, I understand the theory, still I'm not certain how to apply it in practice, so I'd like to ask : what are your pipelines? do you choose colors manually or do you have a process, perhaps choosing a distant color and doing gradients ? Really good start! Although that dog could be future improved. @snv - thank you ^^. Yes I felt the same way, the legs specifically, however I'm not certain how to do that. It was my first PA attempt at an animal :) . >Yes I felt the same way, the legs specifically, however I'm not certain how to do that. 2. Drawing same animal and its parts at different angles and detail. I heard a few renaissance painting were done by several artist, each of whom trained at drawing different things (one did fish, other did rare flowers, etc...). As I understand it, realistic art is 95% training by drawing from reference and the other 5% talent. Non-realistic/cartoon art also includes training, but also analysis of what features to exaggerate. Thank you very much snv. Realized I should make art with references more. I just wanted to let you know that your rate of progress is excellent! You can really see massive improvements in your style and technique over a very short period of time. For your most recent pieces, I notice that the top character's right foot (the one that is facing us directly) is a little lacking in definition and shading. On the bright side, you don't have this issue with your knight. Additionally, the perspective on the knight's cloth skirt seems slightly off. I do particularly enjoy the shiny highlights that you added to the knight's metal armor, though! In general -- great work!